A couple days ago, Joan and I went on a ramen run in Fountain Valley and shopped a bit at Ebisu mart. We bought a couple ramen kits. I should have read the garnish instructions the day before I decided to start cooking. They recommend that you add ham, fish cakes, boiled egg, and green onion. Otherwise you will have very plain looking ramen. I just went ahead and Tried the ramen with just the noodles and broth. Over all: The ramen tasted really good. I liked the fact that it came in two servings. You are able to control how strong the broth is. It was surprisingly oily. The salt levels weren’t intolerable. This broth mix does contain MSG. My hands are actually tightening up as I type. The noodles were great. I tried it while firm and soft. I liked them both ways. One thing I noticed and really enjoyed was the smell of the miso broth, it gave such a nice aroma. 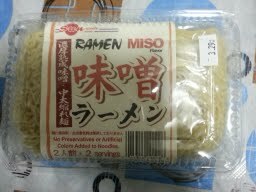 I have had miso ramen before (instant and authentic) but I guess with all the garnishing the scent never stood out before. I really liked the fact that the noodles weren’t dehydrated. They soften in minutes. You need to add more effort into Sun noodle ramen. You have one small/medium pot to boil the noodles and another pot or kettle to boil water to mix with the broth. They recommend you to add about one cup to one and a half cups of hot water to make the broth. I recommend that you use less of the broth mix or add more water. I’m pretty sensitive to high sodium so that would be my preference. I finally got Aaron to try ramen! Aaron is my fiance and I have been trying for over a year to get him to try. I asked him a series of questions and he almost didn’t give me a review because it was his first time trying this type of ramen. I thought the ramen was kinda close to the ramen house but I still have to ask him to compare it to Top Ramen. He really enjoyed it. He said the broth was salty but not over whelming and he really liked the taste of the noodles. I was just happy that he liked it. I can’t wait to take him to an actual ramen house. That’s pretty much from me. I would make that my first choice in at home instant ramen. Just next time I will use maybe half the broth mix. This entry was posted in California, Cooking, Food, Foodie, Japan, Japanese, Ramen, Ramen Run and tagged Broth, cooking, Instant noodles, Instant ramen, Miso, Miso ramen, Noodle, Ramen, Sun Noodle, Sun Ramen. Bookmark the permalink. Pingback: top ramen | trying out the stay at home mom thing!